The people who make Super Mario 3D World want you to know that it's pretty great. Well, of course they do. They created it. Their job is to get us playing and enjoying it. Their thoughts on the latest Mario game are about as objective as a soccer mom's evaluation of her kid's athletic performance. But they're particularly proud of this one, and they speak of the upcoming Wii U game as if this is the next great Mario—the next big platformer that we'll hold up on the level of greats like Super Mario World and Super Mario Galaxy. From what both Stephen and I have seen so far, it seems like they might be onto something there. Earlier this week, I went to Nintendo's offices in midtown Manhattan for a group video conference with a handful of other reporters and three of Nintendo's top creative people in Tokyo, all of whom are working on Super Mario 3D Land. On the left is Yoshiaki Koizumi, a producer on the game. On the right is Kenta Motokura, one of the two directors. In the middle is the man who made Nintendo what it is today: Shigeru Miyamoto, creator of Mario, and the person who, before the video conference started, actually arranged all those cat dolls so they'd be framed perfectly in the camera shot. These guys belong to EAD Tokyo, Nintendo's top development wing. They were responsible for the fantastic Super Mario 3D Land, and the stellar Galaxy games before that. They've got some ideas about what makes a Mario game great. And they think they've done it here. 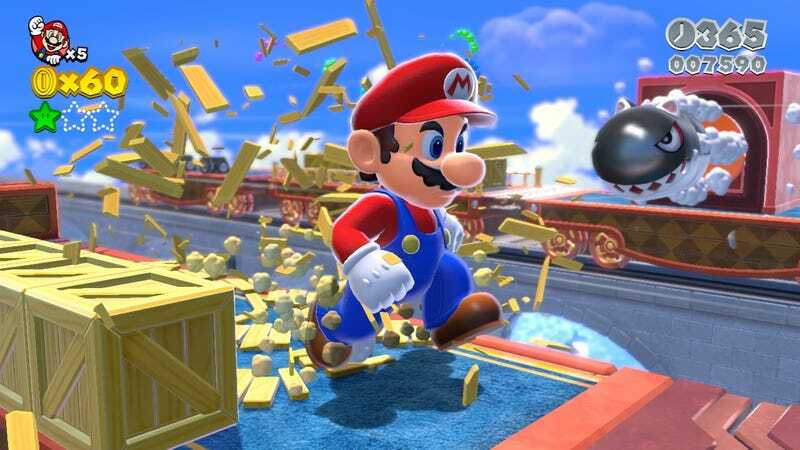 "The joy of a 3D Mario game for me is really that you’re able to move freely in any direction and use lots of different fun actions while exploring a world," said Miyamoto, speaking through a translator. "The joy of a 2D Mario game for me is that anyone can play these games and have a good time, even if it’s their first time playing a game. There’s a certain kind of simplicity to the concept of simply proceeding in one direction and reaching the goal. "The first time I think that we brought all of these disparate elements from these two different series together was in Super Mario 3D Land. But in the case of Super Mario 3D World, I think that we’ve found a way to evolve further in incorporating all of these elements, or have reached another goal, if you will. "Now that’s not to say that we may not make more games in the vein of Super Mario Galaxy in the future. I’d certainly like to consider that possibility. But our goal right now is to expose as many people as possible to this type of gameplay in a 3D world. And I think what we’ve come up with here is the most balanced system in which to do this." In recent years, there have been two different types of Mario games: there's the good-albeit-generic New Super Mario Bros. series, which comes along frequently and recycles many of the same ingredients; and then there are the 3D games, like 2011's Super Mario 3D Land, which are typically single-player, far more innovative, and significantly more challenging. Super Mario 3D World, which comes out November 22, is something of a blend between those two styles. It's the first 3D Mario platformer with multiplayer, and it uses co-op in more interesting ways than any New Super Mario Bros. game. During one level I played with a couple of other reporters in Nintendo's NYC office, we had to unlock a series of doors by hopping on a whole bunch of panels that swapped between blue and yellow every time someone jumped on them. To get each door open, we'd have to flip all the panels to yellow. Enter chaos, and the frenetic fun of four people trying to coordinate their jumps so they land in the right places at precisely the right times. "We talked about all of these ideas in terms of how players experience them," said Motokura. "What do people find to be fun, what do people consider to be cute—and certainly that’s one of the directions that took us to the cat idea. We talked about what people find to be scary. All of this was based on player experience." In other words, they've pulled out all the stops for this one. Just two or three levels in Super Mario 3D World contain more originality than the entirety of a New Super Mario Bros. game. Could this be the next great Mario? "If you think about this game only in terms of the number of courses it has, which is similar to previous games, you’re gonna miss out on the fact that there’s so many new ideas and surprises contained within," Miyamoto said. "Whether it’s the ability to have multiplayer with your friends and family nearby, or how much fun you can have trying all sorts of different characters and the different ways that they can get through the levels and surprises within." Stay tuned over the next few days for more from my conversations with the people who make Mario.